Microorganisms are everywhere. They can be found in the air, soil, water, on animals, and even on humans. Some are beneficial, such as those used to make fermented dairy, bread and wine. Some cause food spoilage. And, a small number are pathogenic (or harmful) and so can cause disease, such as foodborne illness. The types of microorganisms can contaminate food and cause foodborne illnesses include bacteria, viruses, and parasites. Another group of microorganisms that one also needs to be concerned about are fungi, which are yeast and molds. When harmful microorganisms get into food and it is eaten, foodborne illness could result. The most common symptoms of foodborne illness are: diarrhea, vomiting, fever, sore throat with fever, and jaundice. Foodborne illness can be grouped into two categories namely; food infection and food intoxication. Food Infection occurs when food contaminated with harmful microorganisms is ingested, while food Intoxication is as a result of eating food contaminated with the toxins (poisons) produced by some types of bacteria or mold; eating food contaminated with other biological or chemical toxins. Yet, there are some microorganisms which cause toxin-mediated infection that occurs when the microorganisms in the contaminated food proliferate in the body after ingestion and then release toxins. Bacteria, as with most microorganisms, are not visible to the naked eye. Therefore, you cannot look at a food to determine if bacteria are there. Pathogenic bacteria cause foodborne illness and can grow in potentially hazardous food. Potentially hazardous foods are moist, have low acidity, and contain protein. Some examples of these foods are meat, milk, cooked vegetables, cooked rice, baked potatoes, poultry, and seafood. Unlike animals and plants that are made up of many cells, bacteria are single-celled microorganisms. They come in varieties of shapes and are impossible to see without a microscope. Only when bacteria are in the form of a vegetative cell are they able to grow in food. However, some types are able to change into a different form, called a spore. When bacteria are in the form of a spore, they cannot grow in food. One major concern with spores is that proper cooking does not destroy them. Cooking will heat shock the spore so that it can turn back into a vegetative cell. If potentially hazardous food is cooked and then allowed to sit at room temperature, the heat shocked spores become vegetative cells; the vegetative cells then grow, and if their number is large enough, they could cause foodborne illness. Therefore, it is very important that potentially hazardous foods be maintained at proper temperatures after cooking. If they are not at proper temperatures, they must be thrown out after four hours. Cooking or reheating potentially hazardous food that has been temperature abused will not always make it safe to eat. As stated earlier, some bacteria form toxins and unfortunately, not all toxins are destroyed by proper cooking. Therefore, if potentially hazardous food is kept in the temperature danger zone for more than four hours, toxins might be produced. Common foodborne bacteria that cause produce toxin and cause food intoxication include Bacillus cereus, Clostridium botulinum, Clostridium perfringens, Shigella, Staphylococcus aureus. Those implicated in causing food infection areCampylobacter, Listeria monocytogenes, Salmonella, Vibrio, Yersinia. Viruses are the smallest of the microorganisms that can also cause foodborne illness. One cannot also look at a food to determine if viruses are present. They are different from bacteria in that they do not grow in food and simply use food as a vehicle to get from one person to another. Therefore, viruses can contaminate any food. Water, salads, shellfish, iced drinks, and other ready-to-eat foods are sources of viral foodborne illnesses. Examples of viruses that cause foodborne illnesses are Hepatitis A, Norovirus and Rotavirus. Like bacteria and viruses, most parasites cannot be seen. Like viruses, parasites also do not grow in food. There are two ways that parasites are commonly transmitted to humans through food: (i) Some parasites present in human feaces may contaminate drinking water or foods handled by infected persons, or vegetables and fruits grown on soils fertilized with infected feaces; (ii) Parasites naturally present in many animals, such as pigs, cats, rodents, and fish, may be transmitted if their meats are not cooked to proper endpoint temperature. Examples of parasites that can cause foodborne illness are: Cryptosporidium parvum, Cyclospora cayetanensis, Giardia duodenalis, Toxoplasma gondii. Molds usually spoil foods, while some produce toxins which can cause illness. Molds can grow in a wide range of foods, but unlike bacteria, mold can grow in foods which have high acidity and low moisture content. Freezing does not destroy molds, they need air to grow and most produce spores. These spores can be transported by air, water, or insects. Spores produced by molds, when dry, float through the air and find suitable conditions where they can start growing again. While most molds like warm temperatures, they can grow at refrigerator temperatures – 41oF (5oC) or colder. They can also tolerate salt and sugar, so they can grow in opened jars of jams, jelly and on cured, salted/salty meats, such as ham and bacon. Molds form roots and branches which are like very thin threads. 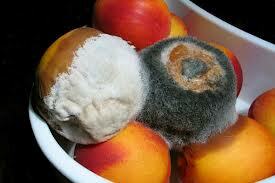 The roots may be difficult to see when the mold is growing on food and may also be very deep in the food. Therefore, if mold are seen on a food, the whole of it must be discarded and not just the moldy portion, as most people commonly practiced. Some molds cause allergic reactions and respiratory problems, and a few molds, in the right conditions, produce mycotoxins (myco – fungi) which can make a person sick. Mycotoxins are produced by certain molds found primarily in grain and nut crops, but are also known to be on fruit juice, apples, and other produce. However, not all molds are harmful. Some are used in industrial and food fermentation. Yeasts are another group of fungi commonly found on plants, grains, fruits, and other foods containing sugar. They are present in the soil, in the air, on the skin, in the intestines of animals and in some insects. They are transferred from place to place by people, equipment, or food and air currents. Yeasts mainly cause food spoilage and do not really cause foodborne illness. Buy all food from an approved and safe source. Cooking foods to proper endpoint temperatures is the most common way to eliminate parasites from food. Frequently and properly washing of hands. Store foods properly and only use cleaned and sanitized utensils and surfaces to store, prepare, and serve food. Keep food out of the temperature danger zone – Cook foods to proper temperatures and hold potentially hazardous foods at 41oF (5oC) or colder or 135oF (57oC) or hotter. The write-up could present just what it wishes to share to the scaners. This has been a really successful technique which will came to your profitable output for a lot of who have been fortunate enough to uncovered this! Hi my friend! I wish to say that this article is amazing, great written and come with almost all important infos. I would like to peer more posts like this. I am really enjoyed for this site. Its an educational topic. It aid me really much to fix some troubles. Its chance are so great and working style so fast. I consider it might be aid all of you. Thanks a lot for enjoying this splendor website with me. I am appreciating it quite a lot! Seeking ahead to another great website. Good luck to the creator! all the best! It was very useful for me. Keep sharing this kind of ideas in the long term as well. This was truly what I was searching for, and I am glad to came below! Thanks for sharing this sort of a details with us.